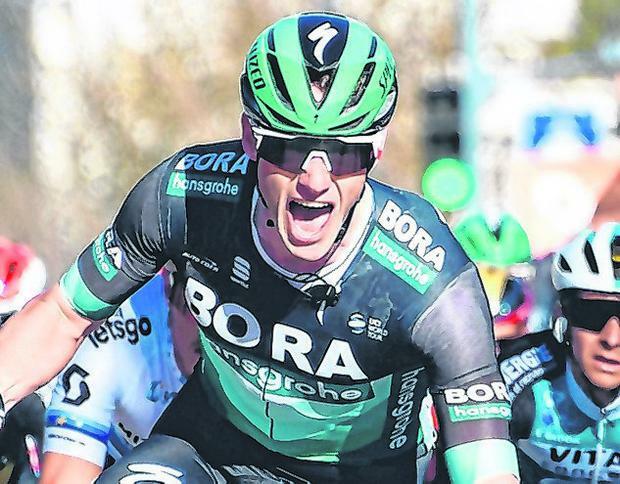 Sam Bennett sprinted to his second victory of the week at French stage race Paris-Nice yesterday when he outgunned a reduced front group at the end of stage six in Brignoles. With three climbs coming in the final 50km of yesterday's 176km leg breaker, Bennett hung onto the whittled-down front group as Team Sky set the pace for their race leader Michal Kwiatkowski when the road began to incline. With the peloton split into four distinct groups, Bennett was one of a handful of sprinters to stay in contact at the front and had Bora-Hansgrohe team-mates Jempy Drucker, Pawel Poljanksi and Felix Grossschartner with him as French team FDJ took up the pace at the front for their sprinter Arnaud Demare in the final kilometres. "I thought I was gone on the second last categorised climb," admitted Bennett afterwards. "But I managed to hold on, and the guys did a fantastic job in the final kilometres for me. I came around on the descent and actually, in the last 5km, my legs were really good so I knew I didn't have to panic with regards to positioning for the sprint, just follow my team-mates as best as possible." The sprint to the line, however, proved pretty chaotic, with Bennett seemingly out of contention and trapped on the barriers behind Demare in the final 300 metres before squeezing himself through to the front when daylight appeared a few seconds later, to claim his fourth victory of the season by half a bike length, ahead of Demare and European champion Matteo Trentin (Mitchelton-Scott). "The team did amazingly to put me in a great position again," smiled Bennett. "I thought the gap was closed on me in the final, but it opened again and I was able to kick really hard and get past. "When you have the confidence, everything's flowing. For a sprinter, when you're winning, everything seems to go so smooth. You don't have to fight for it, it just seems to happen. The form is here." Although yesterday's undulating route wasn't expected to end in a bunch sprint, Bennett hoped otherwise and had the stage in the back of his mind all week, if not for victory then at least for preparation for the mammoth Italian one-day classic Milan-San Remo next weekend. "I wasn't sure how it would go but I thought today could be do-able," said the Carrick-on-Suir sprinter. "I was going to give it a push and if it didn't work out, then I wanted to go hard anyway, just for preparation for San Remo next week. I've been working really hard this winter with the target being Milan-San Remo." Bennett's second victory also propelled him into the green jersey of points leader yesterday, ahead of race leader Kwiatkowski.